The latest version of the G-Class is here and we have already developed a G500 W464 tuning project which produces serious power for the rugged SUV. The significant power boost comes from our expert Bosch MED17.7.5 tuning alone, without any added hardware parts, and it results in a spike from 422 hp and 610 Nm to massive 514 hp and 746 Nm of torque. 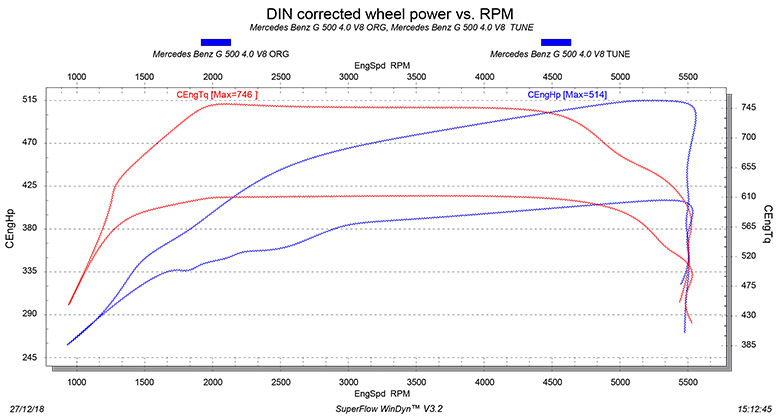 And that is only Stage 1 tuning for the W464 G500. 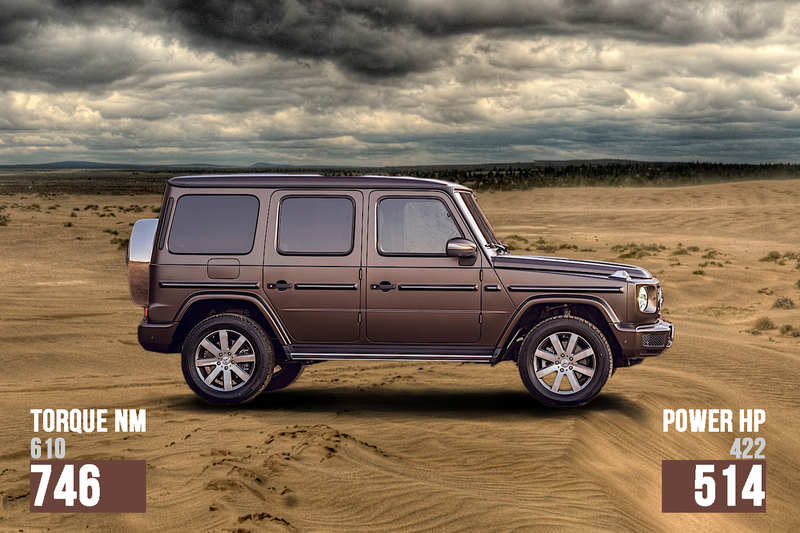 This brings it very close to the G63 version which commands a significantly higher price and running costs. On the other hand, the Stage 1 G500 W464 tuning requires no new parts and it provides far more power than the stock setup. If you want even more power, all the way up to exceeding the AMG version, you can opt for our more advanced tuning stages. Before that, let us see what the Stage 1 Mercedes-Benz G500 W464 tuning brings. M176 tuning is not a new thing for us. Neither is working on the OEM ECU Bosch MED17.7.5 tuning. However, the W464 is completely new on the market and it makes use of some of the latest tech solutions, including the 9G-Tronic gearbox. This means that even though we are familiar with improving the M176, as well as its other variants in the form of M177 and M178, we had to pay special attention to tuning this particular vehicle for the first time due to its first use in such a package. Knowing the limits of OEM hardware and carefully testing and data logging is essential for creating a safe tuning and also a durable and reliable one. We are happy to say we have developed a tuning that meets all these expectations and provides a massive power boost with OEM parts alone. The process starts with an adjustment in the turbocharger pressure. This software tweak results in more air being sent into the cylinders. More air also means more oxygen and oxygen is essential for the combustion process. However, the air doesn’t burn on its own. It needs fuel and in internal combustion engines, it is very important to have the perfect air-fuel ratio. So, with the increase in the turbo pressure that results in the increase in the amount of air fed into the cylinders, we also had to adjust the amount of fuel sprayed. This is another software tweak. The newly added air and fuel are the biggest part of the power gains. Simply put, having more air and fuel produces a bigger bang in the cylinders and results in more power and torque. Of course, these modifications produce more stress for all the parts affected, including intake, engine internals and exhaust, as well as gearbox, differential and even suspension. This is why our testing has a major role in G500 W464 tuning. We make sure we push the parts to their limits but never cross them, regardless of the operation mode. You get far more power, but keep the safety. However, this does not conclude our Stage 1 tuning. There is another very important part that makes a big difference in the way the tuned G500 drives. That part is an advancement in injection timing. This is the moment when the spark is produced to ignite the air and fuel mixture. It makes little difference when it comes to adding power, but advancing and retarding it in different parts of the RPM range enables us to widen the torque curve and make the car far more drivable. Moreover, it makes a huge difference in throttle response. After our tuning, the moment you press the pedal, the car reacts. The lag is reduced to the minimum. Combine this with the significant power and torque spike that you get from the first two steps of modification and the M176 tuning performed by our expert engineers results in a car that feels completely different to drive. As previously said, all these adjustments result in the newly gained power and torque that was measured at 514 hp and 746 Nm of torque. As you can see in the image below, we try our best to follow the OEM software architecture, so the low-down torque and the wide spread are still available. This 4 l V8 engine has been very popular in various Mercedes models in the past years. There are three different versions of it – M176, M177 and M178 – and they power some of the most revered vehicles around. For example, aside from the G500, the M176 propels the G550, S560 and Maybach S560. The M177 is the unit behind the performance of several V8 AMG models such as C63, C63 S, E63, E63 S, S63, GLC63 and GLC63 S, AMG GT63 and GT63 S, as well as some models not produced by Mercedes, such as the Aston Martin DB11 V8 and the lovely Vantage. This means that we can tune these vehicles for remarkable results. The wonder we bring with the entry-level Stage 1 G500 W464 tuning is available for most of the cars mentioned – even the ones that start with higher power outputs. The Bosch MED17.7.5 tuning presented here is a great example of what even the entry-level, but high-quality M176 tuning can bring. Contact us to see what we can do for you or, if you are a tuner, register on our tuning portal to start enjoying our versatile tuning services.